It’s a new year, and new years often mean new beginnings. For some, that means the creation of New Year’s resolutions. 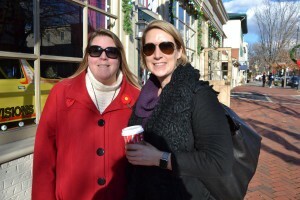 The Sun spoke to local residents and visitors in downtown Haddonfield to see how they celebrated the New Year, their resolutions for 2017 and what they’re looking forward to this year. Sisters Amy O’Shea of Haddonfield and Melissa Gabrielian of London, England, went big this New Year with a progressive dinner party. They went from house to house in the neighborhood to enjoy appetizers, dinner and dessert. 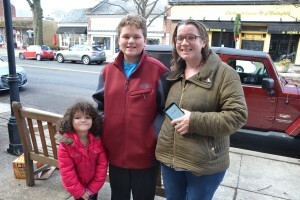 On their journey, they got to watch the First Night Haddonfield fireworks and the ball drop. “I got them for myself as a reminder,” O’Shea said. The O’Shea family is taking a family trip this year to visit Gabrielian’s family in London, as she had to go back after the holidays, and is very much looking forward to that. Gabrielian said she is looking forward to it, too, as well as visiting other family while she is here. Residents Jenny and Ellie Connor, 4, and Mark Magpiong, 12, celebrated their New Year at the Magpiong house, spending time with the family. Mark said he had friends sleep over. Jenny said her resolution is to lose weight and get healthy, while Mark would like to do his best in school and get better grades. Ellie, though a bit shy, said she would like more playdates with her friends this year. 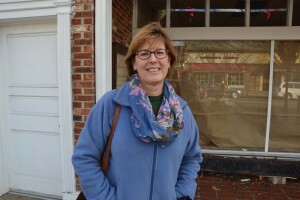 Heather Lacy, who works at the Haddonfield Public Library, spent her New Year watching the movie “La La Land” with her parents, sister and their husbands and then going out to dinner. Lacy said it has become a tradition in the past few years. For 2017, Lacy, like many others, resolved to continue to have good health. “I’m trying to be more aware of taking care of myself,” Lacy said. This year, she is looking forward to her daughter graduating from college and going to Cape May for summer vacation. Pam and Glenn Simpkins of Medford said they went out to eat on New Year’s Eve, but were already asleep before the ball dropped. However, they did go to a party the next day. Though not having particular resolutions, Pam said she would like to continue to lose weight while Glenn said he’d like to be healthy. They both have plans to go to Florida in February to visit family, go out to eat and relax, which they are looking forward to. Jill Wagner said she stayed at home and banged pots and pans along with her neighbors to celebrate the New Year. “(My resolutions are) to be nicer to people and be more compassionate,” Wagner said.